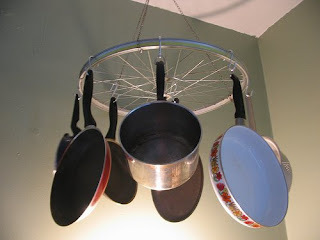 I LOVE this bent bike wheel recycled into a pot rack with aid from some chain and a few S-hooks. I don't have ceilings high enough to have a pot rack...but when I do look out! I wonder how stable and functional it is, but still love the inventiveness of it. This project was originally posted on a cool blog that I linked into somehow called Handmade Detroit. Oh my I LOVE this idea! How awesome for an actual biker too to add their touch to the house.